Due to the misguided construction of Crab Pond, it is customary for some crab owners to set up crab ponds (typically 1 to 3) in ponds, and even account for one-third of the pool area. For the issue of setting up Crab Island in Crab Pool, in the past few years, the author has expounded its harmful effects in some professional newspapers and magazines. Many farmers have already removed Crab Island. I believe that Crab Island is not scientific, and it is also not scientific. There are the following five major harms: 1. Crabs and ponds are set up in the crab island to reduce the aquaculture area, reduce the amount of stocking, and reduce the yield per unit area. Second, with the crab island, crab seedlings easy to make holes, are used to living in the cave, after a long time, because of its reduced activity, it became lazy crab, old crab. The main reason is that the temperature inside the cave is low, which affects the normal growth of the crab seedlings and is not conducive to normal shelling, resulting in a small catch size and low yield. 3. It is easy to hide snakes, rats, frogs, birds and other predators on Crab Island, which is extremely harmful to crab seedlings. The author captures a frog for dissection. There are actually 13 juvenile crabs. It can be imagined that these predators are harmful. Fourth, there is pool of crab Island, often wind is not easy to rise, the pool oxygen content is low, so that crab seedlings can not adapt to bad weather. 5. The vast majority of crab seedlings enter the life of the Crab Island Cave, making it more difficult to get caught and cost more. Generally, a total of 34 people are needed to catch 3 acres of crab ponds. Even if they eat or pay wages, they will cost over RMB 1,000. Even if they do not catch well during the tunneling, they will damage the crab body, affecting the selling price, and more importantly affecting the time. sell. If you do not set up a crab island, how can you solve these problems? In general, the crab pond area is suitable for about 2 mu, preferably square, the whole pond is like a dish type, and the pond slope ratio is better than 1:4. Water depth does not exceed 1.5 meters. The advantages of this pond model are the following: 1. The water area is large, the utilization rate is high, and the oxygen content in the pool water is also high. 2. Crabs are not easy to make holes. 3. The seedling grows quickly and neatly, with little lazy crabs. 4. Can avoid frogs, rats, snakes, birds and other predators, crab seedlings less loss, high yield. 5. To start catching, put a certain amount of water peanuts around the pond when catching, plus a bundle of cotton rods, it is very convenient for catching, and the effect is very good. For this type of crab species, it takes only one to two man-hours to complete the arrest. Compared with a pond set up in Crab Island, the catching fee is 200 yuan per mu. For this reason, it is recommended that the farmers in Chayoda be the best. The Crab Island Pool was transformed into an island crab pool. 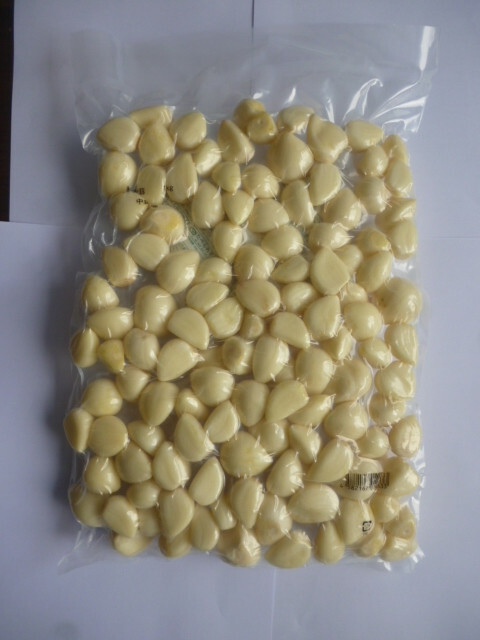 Peeling off the skin is more troublesome when you use the Garlic, wasting time and energy,and garlic skin is also easy to dirty kitchen .We use machines to remove the garlic skin, assisted by artificial,and use vacuum or nitrogen filled packaging, so the shelf life can reach more than three months, which is convenient and simple to use.